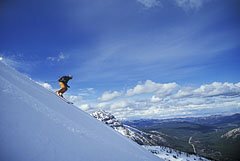 In the midst of protected Jasper National Park, the mountain town of Jasper is minutes away from the superb and varied slopes of Marmot Basin. The mantra here is "uncrowded, unhurried and laid back." You don 't need to say it, you 'll just feel it as soon as you arrive in this rugged Canadian Rockies paradise. Marmot opened in November 15th this year, its earliest start ever – heralding a great beginning to the skiing and snowboarding season, which typically lasts until late April or early May. Expect a continually fluffed blanket of Alberta dry powder across this diverse mountain. This is a cozy getaway buffeted by small-town alpine charm. "The first thing we hear from first–time visitors is: 'Wow, this mountain is a lot bigger than I thought it was going to be, I love the terrain. ", says Brian Rode, Vice President of Sales and Marketing at Marmot Basin. "Skiers love the incredible scenery in an area that's not crowded and very relaxed." Jasper National Park is renowned for its raw wilderness and powerful peaks. Marmot Basin provides 1,675 acres of slopes and 915 meters (3,000 vertical feet) of skiing and snowboarding, all of it just 20 minutes from a town of 4,500 residents. There are 84 marked trails, including gentle and scenic beginner runs, groomed intermediate cruisers, glade skiing and deep bowls for experts. The bowls are playgrounds for powder-hungry skiers and snowboarders. The cruiser runs are regularly worked over by a state of the art fleet. Marmot has recently invested $2 million in snow making equipment that has improved its lower mountain coverage. With the terrain parceled for 30% beginner, 30% intermediate, 20% advanced and 20% expert, there's something for everyone. The resort just announced it has met the necessary environmental criteria to build a new state of the art chairlift system, which will re ready for the 2009-10 season. It will be the longest high-speed quad detachable chairlift in Alberta's Canadian Rockies. And there's just the right amount of après ski and adventure activities, along with accommodations to suit every taste – some of them with fine dining and spas where you can relax after a long and invigorating day on the mountain. If you prefer to take in the terrain without actually skiing it, a recent addition is the 185 sq m (2000 sq ft) deck at the Caribou Lodge, where whether you're a skier or not, you can put your boots up, soak in the scenery and enjoy a snack or meal. Families will appreciate Marmot's family programs, where all children under the age of six – known as Marmot Mites – ski for free. The Ski and Snowboard School provides learn to ski and snowboard packages for kids with packages that include a two–hour group lesson, specially trained pros, and a full day lift ticket and rentals. The Little Rascals Nursery is open daily for children aged 19 months to six years. Trained nursery staff will keep your kids entertained while you hit the slopes. 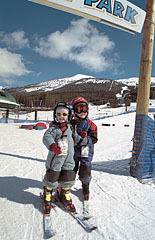 You can even get ski lessons for toddlers, where they will be taught the basics in the beginner area only. You 'll find cell phone service here so you can stay in touch. There is new equipment in the rental shop, including high performance demo skis – no equipment in the rental fleet is more than two years old – and a third of the stock is replaced every year. Visit Jasper in January and you'll enjoy deals on lift tickets, as well as an annual festival that mixes food, indoor and outdoor activities, adventure and culinary delights. It will satisfy families and well as singles or couples seeking après ski fun. There's everything from a Taste of Canadian Wine and Cheese at The Fairmont Jasper Park Lodge to a chili cook off to a "Skate, Soak & Slide" or Oldtimer's Storytime at Jasper Yellowhead Museum. If you visit Jasper any time of the winter, you'll be able to choose from a wide range of outdoor adventures, many of them guided, including snow shoeing, dog sledding, ice walking, and sleigh riding. Jasper is a 4.5 hour drive from Calgaryand a four hour drive from Edmonton, with bus services that can take you directly to your hotel. There is daily shuttle service from Edmonton. If you come from Calgary in a car, bus or motor coach, expect to enjoy one of the most spectacular drives in the world, the Icefields Parkway between Banff and Jasper national parks. You 'll wind past fields of glaciers, wide snow–covered lakes, forests and icefalls. Another great option is Via Rail's weekend Snow Train to Jasper, which leaves Edmonton every Friday at 4 PM, arriving in Jasper at 10 PM . Treat yourself to six hours of spectacular mountain scenery and glimpses of wildlife that you just won't see from the road—and you'll never have to worry about winter driving conditions. The train departs Jasper for Edmonton on Sundays at 4 PM. New this year: complimentary wireless Internet access in the Edmonton and Jasper train stations as well as free weekend parking at the Edmonton station. The Snow Train operates from early February to late April. Get on board! Terrain: 84 trails, 1675 acres of skiing and snowboarding terrain, 30% Novice, 30% Intermediate, 20% Advanced and 20% Expert. Longest run – 5.6 km (3.5 mi). Treed trails in lower area, high alpine, open bowls and chutes in the upper area. Lift System: 9 lifts – One high speed quad, one quad chair, one triple chair, three double chairs, two T–bars, one NEW magic carpet. Snowfall: 400 cm (160 in) average per season. Day Lodges: Three mountain day lodges; one at the base area and two at mid–mountain. Three lounges, 2 cafeterias, 2 dining rooms, several outdoor sun decks and bag lunch areas. Terrain Park: Featuring rail slides, table tops, and jumps. Would you like to give us your suggestions and ideas and have us build a customized ski get-away that fits your schedule and suits your budget? We work with a great wholesaler who can package accommodation and ski passes at great prices. Let us plan the details like tours and transfers, leaving you to enjoy your holiday. Fill out our Vacation Request Form.